…Jane Nicolet Toal, who passed away on August 14, at 96. In May 2011, The Equiery and the Maryland Jockey Club honored a unique sorority of Maryland horsewomen who broke through gender barriers, whether in the horse world or the “real world,” as “Lady Legends.” The following is condensed from the full version, which can be found on our archives on equiery.com. For a woman born in 1921, a 30-year career as a research scientist at the National Institutes of Health was highly unusual – but Jane was unusual, growing up surrounded by male and female doctors, scientists, and athletes. Jane’s father, Benjamin H. Nicolet, received his PhD from Yale at age 21, served on the faculty for the Chemistry Department at the University of Chicago, ultimately settling in Maryland working for the United Stated Department of Agriculture’s Dairy Research Facility in Beltsville. Jane was an active Girl Scout, earning her Golden Eaglet in 1938, the last year it was offered and the highest award a Girl Scout could earn. According to Jane, the award, which was modeled after the Boy Scouts’ award, was discontinued precisely because it was too much like the boy’s program (with a high level of camping and outdoor skill requirements) and organizers thought that the girls’ program should not be quite as rugged. Two friends of her parents, Wilton and Emogene Earl, were influential in Jane’s life. Emogene Earl had her PhD in animal nutrition and worked with Jane’s father at the USDA Dairy Research facility. Her husband, Dr. Wilton Earl, was a tissue researcher for NIH. Emogene Earl would invite young Jane to visit her horse, which was boarded with the Aitcheson family’s original stable on Gunpowder Road in Laurel (before they established their famed stables on what became Riding Stable Road in Laurel). And when Whitney Aitcheson starting taking groups of riders out when he took out his hounds, Jane was right there with him. Soon, two of Aitcheson’s boarders, Drs. Sy and Kate Karpeles, a husband and wife physician team who practiced in Washington, decided that the riders at the Aitcheson stables should pool their funds and help feed the hounds, and the Iron Bridge Hunt Club was formalized in 1937. Jane attended McKinley Tech High School in Washington, DC, the country’s premier science and technology public school built in 1926 with a $26 million dollar grant from Congress. From there, she attended Oberlin College of Arts & Science in Ohio, majoring in chemistry and pre-med, with the idea of becoming a veterinarian. However, when she was unable to put ointment on a horse’s ear, that idea went out the window! In 1946, she received her Masters in biochemistry from Cornell University. After Cornell, she went to work at Rutgers University, but longed to be home with the horses. So, in 1948, when Dr. Wilton Earl, needed a research assistant at the National Institutes of Health, Jane eagerly accepted the position, and it was back home to Maryland, with long days in the lab and long days in the hunt field! Jane worked in tissue cultures, the science of growing cells, a science that ended up lending itself well to the schedule of foxhunting, as the cells needed intensive care for three days (regardless of what days of the week they might be), so Jane was able to arrange her schedule so that she could usually hunt on Wednesdays and Saturdays. By this point, the Iron Bridge Hounds were in full swing, fully ensconced in kennels with a clubhouse off Riding Stable Road and rollicking through the hills of Burtonsville, Savage, Scaggsville and what would eventually become Columbia, Jane whipping-in to Whitney or Leiter Aitcheson every chance she got – and occasionally having to pull huntsman duties herself. Jane spent 30 years at NIH, most of the time supporting the search for cures to cancer, mapping the structure of RNA and DNA, and eventually working on hydrolyzing cells with chromatography, and had her work referenced in the 1996 Handbook of Chemistry. During those years, due to the arduous nature of the research, there were no vacations. After Jane retired in 1977, she threw herself into more hunting, and into traveling. 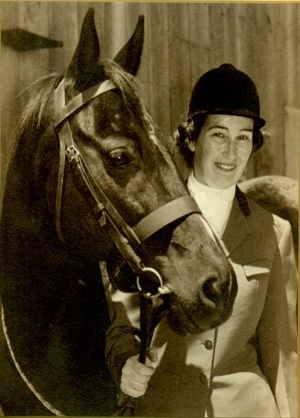 She was particularly fond of riding trips in the west, not hanging up her spurs until 1998 at the age of 77 – but she remained ubiquitous in the horse world, staying active with the merged Howard County-Iron Bridge Hounds, regularly driving herself on 2 to 3 hour round trips to volunteer at horse functions around the state – driving until she was 90! She was a fixture at Maryland Horse Council and TROT meetings. Whenever there were efforts to reestablish the trails along the Patuxent River watershed (the Howard/Montgomery border, the old Iron Bridge stomping grounds), she was there, supporting the efforts. For this, in 2005, Jane Toal was presented with the Maryland Horse Council’s Pumphrey Memorial Award for “behind the scenes” service to the Maryland equestrian community.